A three day Naval Commanders’ Conference is scheduled to be held at New Delhi from 21 Apr 2016. The conference is being held in the wake of the very successful International Fleet review (IFR) held by the Navy at Visakhapatnam in Feb 2016, apart from a number of other notable operational activities such as the first Combined Commanders’ Conference on board Vikramaditya in Dec 15. The Chief of the Naval Staff Admiral RK Dhowan will chair the conference to review various aspects involving operations, acquisition of assets, personnel and logistics issues. The conference (spread over three days) will primarily focus on reviewing the combat readiness and operational preparedness of the Navy including coastal security, to address the dynamic security challenges in the IOR. Hon’ble Defence Minister Shri Manohar Parrikar would address and interact with the Naval Commanders on the opening day of the conference. The conference will also provide an opportunity to the Naval Commanders’ to interact with MoD officials wherein relevant issues to further military synergy will be discussed. During the conference, Naval Commanders’ will review the timelines for capital inductions of the Navy in consonance with the ‘Make in India’ initiative which is aligned with the Indian Navy’s guiding principles of self-reliance and indigenization. The major infrastructure upgrades of the Navy with special emphasis on Aviation assets will also be reviewed. 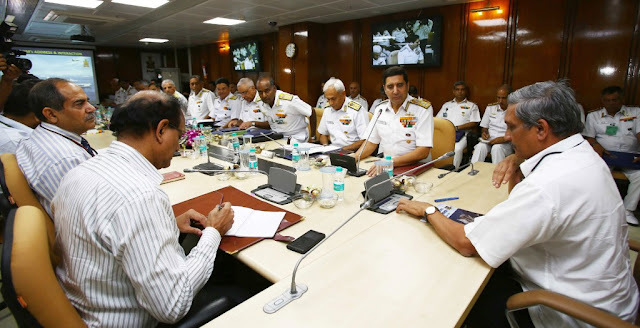 The Commanders shall also delve on various aspects of the Navy’s roadmap for the future such as the key technology enablers, improving logistics and the numerous initiatives to further strengthen cyber security in the Navy. An important focus issue of the conference would also be to review the numerous measures taken to improve the service and living conditions of sailors and civilian personnel. The year 2016 has been earmarked as the ‘Year of the Civilian Personnel’ and accordingly, schemes to improve quality of life and service conditions within the Navy will be reviewed during the conference.